Also, Lecocq: Mam'zelle Angot. Anatole Fistoulari, Royal Opera House Orchestra, Covent Garden. HDTT HQCD152. Facade was one of the early works of composer William Walton (1902-1983) and one that helped establish his career. 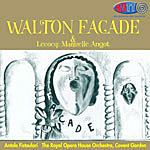 Written in 1922 and first performed in 1923, Facade is Walton's musical adaptation of a series of humorous poems by Edith Sitwell, which he first composed for instrumental accompaniment to the poems, then arranged for orchestra alone (in two suites, 1926), and still later used in a pair of short ballets (1929 and 1931). On the present disc, we get the orchestral suites combined. It seems a little ironic that a composer best known today for the old-fashioned romanticism of his marches, symphonies, and choral works should have begun with the reputation of a jokester. Conductor Anatole Fistoulari presents these eleven musical numbers with wit and sparkle. The items are quite a lot of fun and range from subtle satire to outright burlesque, with plenty of zip and pizzazz to the performances. A set of these items from Louis Fremaux and the City of Birmingham Symphony Orchestra appeared in the late 1970's and might be Fistoulari's closest competition, yet even those recordings can't match Fistoulari in terms of enthusiasm, verve, exuberance, or audio refinement. Coupled with Facade is Mam'zelle Angot, another ballet, this one produced in 1943 and based on an 1872 operetta by Alexandre Charles Lecocq (1832-1918). Here, Fistoulari offers a seven-movement suite from the ballet, which, while it doesn't have the bounce or invention of the Walton pieces, is still charming in its own way, with some of the style of Adophe Adam and even Jacques Offenbach. And with Fistoulari's uncommon zest, the music makes for delightful lightweight entertainment. Recorded by Decca in September of 1957 at Watford Town Hall, London, the sound is crisp and clean and remarkably quiet (thanks to a bit of noise reduction) in this HDTT transfer. You'll recall that the folks at HDTT (High Definition Tape Transfers) do some remarkable work transferring the sound from older, commercially available tapes to compact disc or download. In this instance, they surpass themselves with a transfer burnt to an HQCD in reference-quality audio. The disc displays an excellent high-end range and extension; strong, deep bass; and exemplary midrange transparency. Additionally, one notices a modest degree of orchestra depth and superb transient response, very quick, with sometimes extraordinary impact. Despite the age of the recording, the sonics are extremely good and easily surpass probably ninety percent of what most record companies make today. About the only quibble one could make about the HDTT disc is the short playing time, about forty-five minutes total. However, this is not the fault of HDTT, who simply transferred the original album to disc. It was a short program to being with, and HDTT try to keep things as close to the original source as possible. Besides, this should not be a concern to the music lover since the performances are so good, nor to the audiophile since the sound is so good. It's a win-win argument all the way around. Kate Royal, Magdalena Kozena, Rundfunkchor Berlin; Simon Rattle, Berlin Philharmonic. EMI 50999 6 47363 2 7 (2-disc set). During Austrian composer and conductor Gustav Mahler's lifetime (1860-1911), his Symphony No. 2 was one of his most-popular works. These days, I suspect that claim goes to his shorter symphonies, the First or the Fourth, at least judging by the number of recordings one finds of them. Be that as it may, one can find much to admire in the Second Symphony (1895), which Mahler dubbed the "Resurrection." I mentioned a while back that conductor Bernard Haitink, a noted Mahlerian, once said if one played Mahler's music straight, without much personal embellishment, there was enough drama for the music to speak for itself. 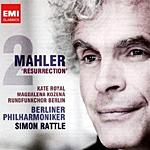 That's not exactly the way Sir Simon Rattle seems to view it in this, his second, recording of the "Resurrection," with all of his Berlin players appearing to go more in the direction of sheer beauty than serious drama in the work. It's been a while since I last heard Rattle's older recording with the City of Birmingham Symphony Orchestra, but I remember it sounding more vital than this new one with the Berlin Philharmonic. As was common with the composer, Mahler was toying with notions of life and death in the Second Symphony, in particular advancing his beliefs on the joys of the next life, after resurrection. The Second Symphony is a long work, even by Mahler's standards, and here under Rattle it comes out at a little over eighty-six minutes, necessitating a second disc. Well, Mahler took over half a dozen years to write the work, off and on, so maybe we shouldn't hold it against a conductor who wants to take his time as well. A long funeral march makes up the first movement, a march not unknown to Mahler symphonies. The composer said of it that he was laying to rest the hero of his First Symphony and asking the question, What's next? Critics trying to make connections among Mahler's symphonies often conclude that all nine (or ten or eleven) Mahler symphonies form one big, continuous whole. In any case, under Rattle the funeral procession is longer and slower than usual, particularly at the beginning, but when the conductor reaches the middle portion, the music opens up considerably. This first movement clocks at over twenty-four minutes and occupies the entire first disc. There is no question that Rattle's way with the music is flattering to its lyrical virtues, but I thought it missed some of its Wagnerian grandness. Mahler once famously remarked that his symphony "must be like the world, it must contain everything." Later, he said the symphony must "make full use of the expressive possibilities that were won for music by Wagner." I'm not sure Rattle takes Mahler at his word. By the end of this Allegro maestoso, you kind of feel as though you'd walked more than a few miles in a funeral procession yourself. I can't say it inspired me the way I recall Rattle's earlier version did. Things seem more normal for Rattle in the second and third movements, with speeds and contrasts closer to what I enjoy. Of the slow Andante (in landler form, a dance precursor to the waltz), the composer said it represented memories of happy times in the hero's life, yet it seems somewhat at odds with the rest of the music. Rattle gives it a pleasant lilt before moving into the Scherzo-like third movement, one of Mahler's typically sarcastic waltzes, sounding like parody or burlesque, apparently mocking Man's aspirations in life. Here, Rattle provides an enlivening bounce. Then, in the brief, quiet fourth movement, Urlicht, Mahler inserts one of the Wunderhorn poems he so loved, and it acts as a sweet, calm transition into the massive, semi-choral Finale. The work ends in a glorious last judgment and resurrection, or, as Mahler put it, "I shall die, so as to live." Rattle seems most at home in this closing segment. He finally has a chance to abandon beauty for beauty's sake and go for the jugular. Although he still appears to put too much emphasis on creating poetic contrasts (the heavenly choir is barely audible at times, it's so soft), at least he never neglects the inherent melodrama of Mahler's religious intentions. Be this as it may and despite some glorious moments from the Berlin Philharmonic, who play magnificently, Rattle's performance in general left me less moved than other conductors have, including, as I say, Rattle himself in his previous EMI rendition. 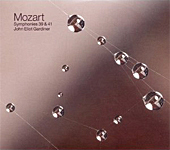 Recorded in concert at the Philharmonie, Berlin, in 2010, the sound is first row, if not quite first drawer. There is adequate clarity and body to the sonics at the expense of much resonant bloom or orchestral depth. The dynamic range and impact seem a bit held back, in spite of the closeness of the microphones, at least until the finale where the dynamics practically run wild. As it goes along, one notices a certain dullness to the sound, too, a minor veiling of the highs especially. For a sonic comparison, I put on Otto Klemperer's EMI disc from fifty years earlier and found it far more transparent and realistic. So much for technological advances in audio. Also, Fantasy in G minor; Fantastic Scherzo. Michael Ludwig, violin; JoAnn Falletta, Buffalo Philharmonic Orchestra. Naxos 8.572323. You have to give conductor JoAnn Falletta and her Buffalo Philharmonic credit for tackling works that are somewhat out of the mainstream, music from the likes of John Corigliano, John Duffy, Kenneth Fuchs, Daron Hagen, Jack Gallagher, John Powell, and Marcel Tyberg, as well as more familiar folks like Richard Strauss, Franz Schubert, and Ottorino Respighi. On the present disc she undertakes the music of violinist, teacher, and composer Josef Suk (1874-1935), whom more people probably know in his native Czechoslovakia than know him in America. Indeed, people may even know him better as Antonin Dvorak's son-in-law than as a musician and composer of tone poems. He was first a student of Dvorak and then married Dvorak's daughter. But both his mentor and his wife died in the years 1904-05, devastating the man. The music we get on this disc, however, comes from earlier and happier times. The program opens with the Fantasy in G Minor, Op. 24, which Suk wrote in 1903. It begins with a healthy blast of sound and then moves into kind of Bohemian Gypsy territory, where we hear the influences of Dvorak and something of Hungarian composer and pianist Franz Liszt. I'm not sure what this twenty-three-minute piece represents, but with violinist Michael Ludwig lending it a delicate tone and Ms. Falletta providing a sympathetic and often robust accompaniment, it is surely captivating in its varying moods, from sentimental to exuberant. 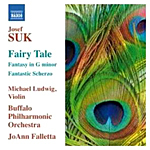 The centerpiece of the album is Suk's Pohadka (Fairy Tale), Op. 16, from 1898, a suite of four movements drawn from music he wrote for a theater piece. Much like Rimsky-Korsakov's Scheherazade, with flashes of Smetana's Ma Vlast, the Fairy Tale describes events in the lives of two lovers, a Prince and Princess from rival kingdoms and their conflict with an evil sorceress. The section titles are self-explanatory: "About the constant love of Raduz and Mahutena and their trials"; "The game of swans and peacocks"; "Funeral Music"; and "Runa's curse and how it was overcome by true love." Like his Russian and Czech counterparts, Suk provides plenty of color in this music, and like Richard Strauss and other tone poets of his day, he conjures up vivid images in his compositions. Falletta and her players seem almost joyous in their desire to make these stories come to life, with Ludwig's violin always sweet and light. No, Suk's music does not convey the same exquisite beauty or elicit the same excitement as Rimsky-Korsakov's Scheherazade does, and Suk's suite gets more than a little bombastic toward the end, but that doesn't stop the performers from giving it their best shot. The program ends with the Fantasticke Scherzo in G Minor, Op. 25, from 1903, another evocative work from Suk. It was for me, unfamiliar with this music, the highlight of the disc, reminding me in part of Mendelssohn and Bax. Lilting, airy, flamboyant, and a little overwrought, it is nevertheless mostly delightful in its rustic, bucolic way. As always, Ms. Falletta and her forces play it with a zesty charm. Is any of this great or memorable music? No, Josef Suk has not quite made it into the pantheon of truly important classical composers, and his works are not (yet) a part of the basic orchestral repertoire. Nevertheless, that doesn't mean one shouldn't seek him out and appreciate his music for the moment. It is highly accessible and easily enjoyed, especially when it's as well played as it is here. 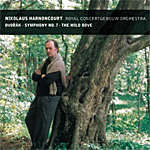 Naxos made the recording at Kleinhans Music Hall, Buffalo, New York, in May of 2010, capturing a big, splashy sound that does justice to the music. There is an ample dynamic range, strong impact, good clarity, and a fine sense of air around the instruments to satisfy most discerning listeners. Then, too, a fairly wide stereo spread and a realistic illusion of stage depth add to the recording's verisimilitude. Highs ring out with sparkle, clearly and effortlessly, and the bass makes a statement when necessary. The violin featured so prominently throughout the selections never overpowers the orchestra or vice versa, the audio engineers nicely balancing it against the other instruments. This is entertaining, largely playful light music served up in equally pleasing sound. 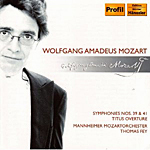 Thomas Fey, Mannheim Mozart Orchestra. Profil PH05047. I never had any doubts about the sonic merits of this recording from the opening notes. It sounds terrific. But I did question whether it was a period-instruments band playing, given that the first few moments of Symphony No. 39 feature timpani prominently, and they certainly sounded like period drums. Yet the strings seemed modern. It turns out that maestro Thomas Fey and his Mannheim Mozart Orchestra use period performance practices and period timpani and brass, but at the same time they use modern strings. So, it was just as I thought: They use the best of both worlds, and the results, while different, are worth a listen. Fey and his players take moderate tempos, yet they are lively and energetic, too. He doesn't conduct either symphony in quite as exhilarating a manner as Daniel Barenboim plays them in his old EMI English Chamber Orchestra readings, but Fey is nevertheless on his toes. Symphony No. 39 is especially buoyant after its somewhat somber introduction, but it's the "Jupiter" Symphony that is the marvel. At first I had some doubts about the rather leisurely pace of the first movement introduction and again during the third movement Minuetto, but the conductor puts all doubts to rest as things warm up. Never too fast, never too slow, Fey seems to have a knack for picking the right pace and spicing it up with the right dynamic contrasts. Maybe the "Jupiter" doesn't have quite the overall sparkle of Eugen Jochum's celebrated DG recording with the Boston Symphony, but I think the listener will find joys here of their own. So, just how much did I really like these interpretations? After listening to both works, I immediately sat through them a second time. Yes, the performances impressed me that much. However, I wouldn't consider them first-choice recommendations; they're a little too different for that. The sound the Profil engineers get on this 2005 recording is quite clear and clean, with a wide stereo spread, excellent transparency, and strong transient impact. One must count the sonics here among the better one can find in these Mozart symphonies, even though the timpani and brass are quite prominent. Antal Dorati, London Philharmonic Orchestra. HDTT HQCD139. "Bracing" is how a friend described this 1966 album of Strauss waltzes to me many years ago. 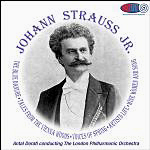 The disc contains five popular works by the "Waltz King," Johann Strauss, Jr. (1825-1899), conducted with vim and vigor by Antal Dorati and the London Philharmonic Orchestra. I think my friend's description put me off buying the album, though, since "bracing" was not exactly what I had in mind for this music. I have always been more attuned to the Viennese style embraced by conductors like Boskovsky, Reiner, Karajan, Ormandy, Bohm, and Kleiber, with their more lyrical, lilting, romantic manner. So, it was a delight finally to hear these Dorati performances, which are really quite a lot of fun, remastered by HDTT (High Definition Tape Transfers) in splendid sound. Dorati takes the opening "Blue Danube" at an enlivening pace and reminds one that this conductor's interpretation is not for dancing but for listening. After that, Dorati presents "Tales from the Vienna Woods" at a slightly more moderate tempo, yet it's still plenty animated. Expect no sentimentality here. Next, we hear "Voices of Spring," voices that are definitely not timid utterances but strong March winds and forceful April showers. This is not Strauss for the timid. Dorati's way with "Artist's Life" is in a similar vein, with the emphasis on robust execution over light rhythms. The program concludes with "Wine, Women and Song," which probably benefits most from the conductor's invigorating design, and, as they do in all the numbers, the LPO play wonderfully well. Interestingly, this final waltz also displays the most-substantial bass response, making it quite...bracing. Decca recorded the album in their Phase 4 series, a multi-miking technique the company used for many of their recordings in the Sixties and early Seventies. Whether one likes or dislikes the sound turns out, as expected, to be a matter of one's personal listening taste. Many people seemed to love it for its dynamic qualities and its precise left-to-right imaging, while audio engineers, record producers, and orchestra conductors liked it because it gave them a good deal of flexibility after the fact for tweaking the final product. Many audiophiles, however, disliked Phase 4 because it provided so little orchestral depth and tended to pin instruments to the wall like so many museum specimens. One thing's sure, though: The aggressive nature of the Phase 4 recording works well with Dorati's assertive approach to Strauss's music. The folks at HDTT, who transferred the music from a commercially available Decca Phase 4 tape, were kind enough to send me two copies of the recording for comparison, one burned to a gold CD, the other to an HQCD. I used two separate CD players (a Sony and a Philips) for quick comparisons, and because I have no remote for my preamp, I persuaded the Wife-O-Meter to volunteer her services to switch on the fly between the discs. In addition, I traded out the discs twice between the players to be sure I wasn't hearing any idiosyncrasies in the sound of the machines. Let me tell you in advance that, yes, I heard differences, small but distinct, with every change of disc. Until now, I had always considered gold the best medium for CD reproduction, at least when pressed. But HQCD seems now the preferred new standard of quality. HDTT, who also sell blank HQCD's at their Web site for buyers wanting to burn their own material, say of the product: "HQCD, or High Quality Compact Disc, is a state-of-the-art disc made from special materials and dyes, ensuring the best possible data transfer rates during the data burning process. HQCD media discs repeatedly yield the best sound quality possible from digital transfers because of their low BLER (Block Error) rates and lowest possible jitter rates." In comparing the two discs, to my ears and on my equipment the gold-disc transfer was less consistent in its sound, sometimes appearing slightly warmer and softer than the HQCD, sometimes harsher and less detailed. On the HQCD, the sound appeared routinely better focused, yet smoother, too. The string tone, especially, which the Phase 4 miking makes brighter and more forward than I like, seemed better tamed, more natural, on the HQCD. Finally, in matters of dynamics, the HQCD appeared to have the advantage as well, with a somewhat tauter, better-defined impact. This is not to say, however, that everyone would hear or appreciate the same differences I observed, nor that they would like one more than the other. Indeed, both discs sounded excellent, and I'm sure that in blind tests some listeners would prefer the sound of the gold disc over the HQCD, for whatever reasons. Certainly, there was nothing wrong with the gold disc, and depending on the sound of one's playback equipment, the sound of one disc or the other might better complement it. Anyway, I wouldn't suggest the Dorati album as an absolute first choice in this material; it's a little too vigorously out of the ordinary to be the only Johann Strauss in one's collection. Yet as a choice to accompany one of the more-conventional recordings listed from the conductors at the top of the article, I highly recommend it. 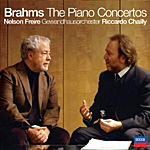 Nelson Freire, piano; Riccardo Chailly, Gewandhaus Orchestra. 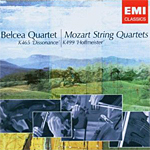 Decca B0006588-02 (2-disc set). When German composer Johannes Brahms (1833-1897) wrote his two piano concertos almost a quarter of a century apart in 1854 and 1878, the public seemed indifferent, and critics were downright hostile. By the middle of the following century, however, both concertos were firmly established in the basic repertoire, the public having slowly accepted them as classics of their kind. I wonder if it isn't time to reassess their importance. The Piano Concerto No. 1 in D minor, Op. 15, was Brahms's first full-scale undertaking in the orchestral field, and perhaps the work suffered from being too much in the shadow and under the influence of Beethoven. The whole first half of the opening movement is too big, stormy, craggy, wayward, and, for me, bombastic for the rest of the piece; then, when the second subject takes hold, the mood is so drastically changed, it comes not so much as a breath of fresh air as a huge question mark. The second movement is a bit too noble yet sentimental to my ears, but it comes off better than the first movement for its having a more stable center, a stronger focus. The final movement is my personal favorite part of the concerto, a notably lighter, more high-spirited affair than the tumult that precedes it, yet also possessing an obvious seriousness. As for the Piano Concerto No. 2 in B-flat major, Op. 83, it seems to occupy an entirely different musical world altogether, one filled with more lyricism yet accumulated gravity as well. Brazilian pianist Nelson Freire is a remarkably talented musician whose most preeminent gift is his complete and utter naturalness, his unforced charm. His playing seems almost casual, it's so smoothly rendered. For this reason, I appreciated his work more in the Second Concerto than in the First, because in the Second he seems more at home. Then, too, he is accompanied quite accommodatingly by maestro Riccardo Chailly, and he's supported by one of the oldest and most-refined orchestras in the world, the Leipzig Gewandhaus. For a set of both the Brahms Concertos, one could hardly ask for more. Unless it's the sound, which comes off as a tad odd. The jewel box says it was recorded live in 2005 and 2006, so I expected the usual too distant or too close miking and audience rustling. I was right; it is recorded relatively close, fortunately minimizing any peeps from the listeners. But as I feared, it's too close. While we're on top of the piano and orchestra, there is little compensating detail revealed. In fact, compared to four or five other Brahms Piano Concerto recordings I had on hand for comparison, this one is closer and softer than any of the rest. 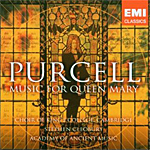 I dunno; it's a nice set of performances, but do we really need more recordings of these pieces when we already have the likes of Giles, Curzon, Kovacevich, Pollini, and others doing them just as well or better, and in better sound? I rather think this set may appeal more to established fans of the musicians involved or to dedicated collectors than to the music-buying public in general. Also, Suite from The Love for Three Oranges and The Ugly Duckling. Andrei Laptev, baritone; Jacqueline Porter, soprano; Vladimir Ashkenazy, Sydney Symphony. Exton hybrid HQ SACD EXCL-00049. Vladimir Ashkenazy has been one of the world's leading pianists for over fifty years, branching off into a simultaneous conducting career about midway through his piano calling. 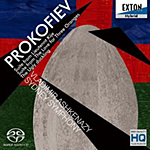 Since then, he has proved himself as good a conductor as he is a pianist, as this latest recording of music by Sergei Prokofiev (1891-1953) demonstrates. The suite from Lieutenant Kije (1933) finds Prokofiev at his most playfully sardonic. Based on a satiric story by Ury Tynianov, Prokofiev's music for the movie version of the tale, presented here in a suite for voice and orchestra, tells of a minor mistake getting out of hand. In the narrative, a scribe makes an error writing the word for "Lieutenants" as "Lieutenant Kije," and the Czar of Russia reads it as referring to a real person. Rather than correct the Czar's mistaken impression, something no one dares do, the army makes up a "Lieutenant Kije" and gives him a complete fictional history, which becomes the subject of the story, the movie, and the music. Ashkenazy introduces Kije's "birth" in a most grand, military style, as though Kije really were an important general. Then, for a change, Ashkenazy gives us the vocal ballad in the Romance. Following that, The Wedding of Kije is appropriately comical in its sarcastic fashion; and the Troika sleigh ride and drinking song, also sung to orchestral accompaniment, are robust. Finally, Ashkenazy is aptly ironic in Kije's mock funeral. The wit is biting, and the conductor and his Sydney players seem to be having fun with it in their earnestly amusing way. Prokofiev based The Love for Three Oranges (1924) on a satirical play by Carlo Gozzi. Here, the music is more obviously, outwardly, humorous than in Kije, with slapstick abounding; and Ashkenazy is not afraid to see it that way. He paints the comic gestures in broad strokes, and while the music may not have the same melodic subtlety or appeal as that in Kije, it is fun in its own right. Besides, everyone will recognize the famous Marche about halfway through. 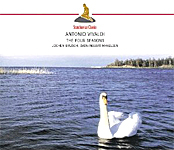 The disc concludes with The Ugly Duckling, for voice and orchestra after Hans Christian Andersen. Prokofiev originally wrote it as "a symphonic poem for voice and piano" in 1915 but decided to orchestrate it in 1932. It is alternately cheerful, boisterous, scary, mournful, festive, and exultant. Certainly, it's colorful music, with Ashkenazy making the most of its varying tonal palette. However, one should not confuse it with children's music; unlike the composer's Peter and the Wolf, this one is much more serious despite its fairy-tale foundation. In terms of sound, the Japanese Exton label calls the disc an "HQ SACD" and says they recorded it "Session & Live." I wish they had explained all of that better. The SACD part is easy enough; it refers to the audio-storage disc jointly developed by Sony and Philips back in the late Nineties, a disc with the capability of high-bit-rate playback in two-channel stereo or multichannel on one layer (requiring a special Super Audio CD player) and regular Red Book playback on another layer (for use with any standard CD player). As for "HQ," that may refer to the use of a unique HQ disc, said to produce playback of better quality and greater consistency than ordinary discs, better even than gold-plated discs. So, theoretically at least, we should be getting the best-possible playback advantages with HQ discs and SACD processing. As to "Session & Live," the booklet note goes on to say "Recording Location: The Concert Hall of the Sydney Opera House" and then below it, "The recording was made at the Sydney Opera House Recording Studio." From this information, I presume we have different portions of the disc recorded live and in the studio. The recording dates were November 5-7 and 17-20, 2009, and since there is never any audience noise from any part of the program, it probably doesn't matter how Exton recorded it. In any case, I listened to the SACD layer in two-channel stereo using an Sony SACD player and found the sound among the best, most natural, most transparent I've heard in ages. The voice in Lieutenant Kije is so realistic, you could reach out and touch the singer (not that you'd want to unless you were really weird, but you get the idea). The stage depth gives the orchestra a lifelike presence; the air around the instruments sets each of them apart, but not in a multi-miked manner; and the wide dynamic range and impact further set the sonics apart. If it weren't for a slight, low-level hum in the background, the recording would be absolute state-of-the-art. Antoni Wit, Staatskapelle Weimar. Naxos 8.557811. 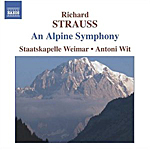 Following his writing a succession of popular, big-scale tone poems like Don Juan, Tod und Verklarung (Death and Transfiguration), Don Quixote, Ein Heldenleben (A Hero's Life), and Also sprach Zarathustra, Richard Strauss ended his love affair with the genre in 1915 with An Alpine Symphony. For some critics, it has always been a low spot in the composer's tone-poem output, no more than a glorified postcard from the Alps. But I have always found it a fascinating journey, and, besides, the writer of the CD booklet notes says it has a lot more intellectual and philosophical substance than most of us were led to believe. Yeah, well, believe what you like, the music still sounds grand. Strauss began writing the work in 1911 and completed it several years later, devoting his final thirty-plus years mainly to smaller works, songs, and, of course, opera. Supposedly, the composer got his inspiration to write the Alpine Symphony while viewing the Bavarian mountains behind his house, mountains he used to climb and enjoy in his youth. But Keith Anderson in the booklet says it is also about Nietzsche's ideas of the freedom of Nature and liberation from the outdated chains of Christianity, plus something about a marital affair and an eventual suicide. Whatever. I just like the music. As you know, the piece is the musical account of a mountain climb, starting in the morning with sunrise, ascending through the woods, by a waterfall, across a meadow, onto a glacier, further on to the summit, weathering a storm, and descending by sunset and ending at nightfall. On Antoni Wit's recording, the trip takes about fifty-four minutes, neither too hurried nor too slow. Certainly, the bargain price of the disc does nothing to diminish one's rewards. Indeed, it may only increase them, knowing the cost is so modest. The orchestra is one of the oldest ensembles, if not the oldest, in the world, founded in 1491. Dang. That was before Columbus bumped into the New World. This is the orchestra Bach played in and that Liszt and Richard Strauss himself once lead. In various guises, the orchestra has been going strong ever since. So, you get a lot for your money. The Alpine Symphony needs a big, strong orchestra like this to do it justice, the work scored for an enormously large group of instruments, including quite a few percussion, an organ, and a wind machine. Wit makes the most of what he's handed, and if his success in the piece doesn't quite match my own favorite, Rudolf Kempe and the Staatskapelle Dresden, another fine old European orchestra, on EMI from 1971, it surely isn't for lack of trying. The EMI recording is just that much more revealing (especially in its EMI Japan release), and Kempe's hand is just that much more sure in guiding the listener up the slopes. The Naxos recording seems a touch heavier and more beclouded than the EMI, and Wit seems a tad less inclined to open up the music emotionally. Nevertheless, Wit produces a fine reading, as spacious and panoramic as the mountains themselves. Besides, as I say, for the price it's something of a steal. Also, Tapiola. Herbert von Karajan, Berlin Philharmonic; Sir Simon Rattle, City of Birmingham Symphony Orchestra; Paavo Berglund, Helsinki Philharmonic Orchestra. EMI 50999 9 07246 2 (two-disc set). Complain, complain, complain. My favorite Sibelius symphonies are the first two, so it's just my luck that EMI would issue numbers four through seven in this excellent, 2011 reissue collection culled from some of the best of their back catalogue. No, of course, I shouldn't complain. They have chosen well, and the selections we find here are among the best you can buy from any company at any price. The fact that EMI are selling this set at mid price makes it a bargain for the music lover who doesn't already have the recordings. Let's go through them one at a time. Finnish composer Jean Sibelius (1865-1957) wrote his Symphony No. 4 in 1911, and it bears repeating that the music has always reminded me of a vast, flat, icy plain, maybe in Lapland, brooding in silence. Recorded in 1976 by Herbert von Karajan and the Berlin Philharmonic, the conductor makes it more measured and more melancholy than ever, the desolation of the landscape all the more complete; and the thing just gets slower as it goes along. Sibelius felt he was near death when he wrote the piece; however, he would last another forty-six years, so I suppose you could say it was a false alarm. Later, Sibelius said of the symphony, quoting the Swedish author Strindberg, "Being human is misery." Don't expect much joy here. Nevertheless, Karajan keeps one involved, even with his extraordinarily broad tempos, making the work seem more lofty and more emotional than some competing versions, including his own earlier DG recording. I would place this performance among those of Ashkenazy (Decca), Barbirolli (EMI), Berglund (EMI), and Vanska (BIS) at the head of the list for the work. Sibelius wrote his Fifth Symphony at the beginning of the First World War, with its premiere in 1915. However, the version we usually get is the revised one from 1919, performed in this collection by Sir Simon Rattle and the City of Birmingham Symphony Orchestra, recorded in 1988. The revised version melds the first two movements into one, making a three-movement construction. Under Rattle, we get perhaps the single best performance in the set. He would record the symphony again, each time with equal success. With its grand gestures, it sounds more like typical Sibelius than the Fourth, and Rattle whips up a good head of steam by the final, somewhat melodramatic conclusion. Sibelius's symphonies got more concise as they went along, with Nos. 6 and 7 his shortest of all. Symphony No. 6 comes from 1923, and we're back to Karajan and the Berlin Philharmonic in a 1980 recording. The Sixth is often Sibelius's most overlooked symphony, yet it's quite lyrical and serene. Karajan was always good at developing big, expansive themes, so he is at home here. It is only in the third-movement Scherzo that the piece picks up any serious animation, which the composer carries over into the first half of the Allegro finale, the tension soon fading into a peaceful ending. Karajan does OK with it, although I tend to like his earlier DG reading better for its greater poetry, if not for its sound. I personally count the versions by Davis (RCA), Berglund (EMI), Barbirolli (EMI), and Vanska (BIS) above this rendition, but there's certainly nothing wrong with Karajan's handling of it. Sibelius's last symphony, No. 7 (1924), is his shortest by far, his combining four movements into one flowing work. Paavo Berglund and the Helsinki Philharmonic handle it well in a 1984 performance that is strong, direct, yet moving, even majestic. Frankly, however, most other recordings of the Seventh tend to pale in comparison to Beecham's (EM), but Berglund's is a good alternative, so it's nice to have it here. 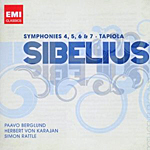 The set ends with Sibelius's lengthy tone poem Tapiola from 1925, again handled by Karajan and the BPO in another 1976 recording. The composer sets the story of Tapio, Finnish god of the forest, in the icy north, making it seem much akin to his Fourth Symphony. Tapiola is a colorful tale that Karajan negotiates handily, in his usual sweepingly grandiose manner. In terms of sound, the best recording is Rattle's CBSO account of Symphony No. 5: smooth, rich, warm, and natural, with good stage depth and fine dynamics. The Karajan Berlin recordings tend to sound more multi-miked, with greater midrange clarity, greater impact, and a brighter, more forward sound at the expense of less orchestral depth. The Berglund Helsinki recording tends to fall somewhere between the two extremes, well balanced and commendably transparent. Six Suites for Violoncello Solo. 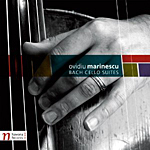 Ovidiu Marinescu, cello. Navona Records NV5840 (two-disc set). You may recall that last year I reviewed a fine, two-disc set of Bach's Six Cello Suites by Zuill Bailey on Telarc. At about the same time, Romanian cellist Ovidiu Marinescu recorded his own renditions of the suites for Navona Records, just recently released and reviewed here. They make another provocative and welcome addition to the Bach catalogue of Suites, and they join the ranks of not only Bailey's recording but those of Rostropovich, Ma, Casals, Fournier, Schiff, Starker, Gendron, Tortelier, Mork, Isserlis, and others. Bach's Six Suites for unaccompanied cello are quite extraordinary, and they might well be familiar even to listeners not acquainted with much of the composer's music. After all, most of us have heard this material used in films and television commercials; heck, even Bach reused some of the tunes for other instrumental works. The thing is, though, the complete six suites make for a lengthy run if you try to sit through them all at once. I doubt that Bach ever intended for anybody to listen to them more than a few at a time, which is why music on CD is always handy; you can listen to as much or as little as you choose or program it your own way. Anyhow, the Suites contain six dance-like movements each. One of the most remarkable things about them is the composer's ability to make the single cello sound like several instruments, with melody and accompaniment, which Mr. Marinescu executes as well as anybody. Naturally, it also helps to have a good recording to capture the varying subtleties of the music and the performances, and Navona do a pretty good job of it. As usual, I didn't try listening to all of them at once; that might have overwhelmed me. And, as I say, I doubt that Bach expected anybody to play them all at one sitting (although there is some evidence of interconnections among the pieces, so, who knows, maybe Bach did want them played consecutively). So, I listened to them one or two Suites at a time and found them quite enjoyable. Marinescu's renderings of these works struck me as reasonably relaxed, stylish, and refined, yet with much personal character. While the soloist seems to place a premium on precise execution above all else, there is also a sense of pleasure and animation in the performances, with clean articulation and rhythmically dynamic cadences. In the process, Marinescu catches Bach's varying moods of joy, meditation, lyricism, amiability, swagger, exuberance, solemnity, and regality at least as well as most of his competition (even giving us two alternative endings to the Prelude of Suite No. 2). Navona recorded the music at Rose Recital Hall in the Fisher-Bennet Hall, University of Pennsylvania, Philadelphia, in 2009-2010. The sound they obtain is crisp and clear, fairly close up, with excellent definition. There isn't a lot of warmth to the sound, however, so it's mainly the disc's clarity we can appreciate here. Still, the sound is seldom too forward, bright, or edgy, and it comes across with great immediacy and realism if played back at an appropriate level. If I have a slight preference for the smoother, more ambient sound of the Telarc recording with Bailey, well, that's just me. The audiophile may prefer the sound of the Navona set better. Navona accommodate the six suites in traditional fashion, three to a disc on two discs, Nos. 1-3 on disc one and Nos. 4-6 on disc two. They enclose the two discs in a Digipak container, with no booklet insert and virtually no printed notes beyond the recording information. Be that as it may, if you put disc one in your computer, you can access a twenty-seven-page informational booklet with background on Bach and his suites (written by Marinescu himself), plus the scores, information on the artist, his other recordings, and the recording company. This digital readout may not be as convenient as having a printed booklet in front of you, but it's certainly thorough. Zuill Bailey, cello; Awadagin Pratt, piano. Telarc TEL-32664-02. 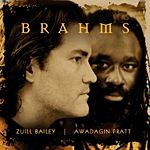 The collaboration of Zuill Bailey, cello, and Awadagin Pratt, piano, two well-known and highly accomplished musicians, suits the works of Johannes Brahms (1833-1897) especially well. The two men have been friends since college and have performed together on numerous occasions, so they have an instinctive feel for combining the right energies in the composer's music. 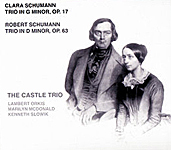 On the present disc, they perform several of Brahms's longer pieces for cello and piano, as well as several shorter songs transcribed for the instruments. The compositions cover most of Brahms's career and explore his varied temperaments, with the two players adapting their style impeccably to each occasion. The program begins with Lerchengesang ("Lark Song," 1876), a brief but lovely piece, light and airy as a bird in flight or in song. It's an apt preface to the early Sonata No. 1 in E Minor, Op. 38 (1865) that follows. The Sonata is a three-movement affair, Brahms having thrown out the slow section on the advice of Clara Schumann. It's a mellow, melancholy work in a lyrical mood. Bailey and Pratt play the piece with great passion, yet with great sensitivity, too. The dynamic contrasts alone give you an idea of the work's power and the artists' joy in performing it. Next, we get a series of shorter pieces, songs mainly, arranged for cello and piano. They start with Feldeinsamkeit ("Solitude in the Fields," 1879), which continues the somewhat melancholy tone of the preceding Sonata, aided by the cello's inherently sonorous sounds. Next is Wie Melodien ("As Melodies," 1886), clearly more melodic, more sweetly poetic in its rhythms than the previous numbers. After that, there is Sapphische Ode ("Sapphic Ode," 1884), describing not what you may think but a verse scheme. Liebestreu ("True Love," 1853) comes next, a particularly passionate little work; then Sonatensatz (1853), actually a violin sonata by Brahms, Robert Schumann, and Albert Dietrich, here adapted for cello and piano; and Minnelied ("Love Song," 1877), which expresses the radiance of young love. Brahms composed his Sonata in F Major, Op. 99 (1886) in a more traditional four-movement arrangement, and it shows the effects of maturity on the composer's music. Not that that is necessarily a good thing, as the piece begins in a much more-agitated fashion than his earlier Sonata. Still, it rises above a surly introduction to achieve a lofty bravura and a tender spirit as it goes along, the performers always in harmonic and interpretive accord with the music and with each other. The disc ends with Brahms's famous Wiegenlied ("Lullaby," 1868). You wouldn't think so familiar a tune could sound so fresh, but these fellows make it come to life once more in a most affecting manner. It concludes the program sweetly and gently--ironically, on the freshest of all possible levels. Telarc recorded the album at the Oberlin Conservatory of Music, Oberlin, Ohio, in 2010. They miked the performers fairly closely, producing a relatively big sound from only the two instruments yet creating a realistically smooth and reverberant sound. While it hasn't quite the lucidity one might expect, it is nonetheless most natural if played back at an appropriate level. It's a luxuriant, well-upholstered sound that nicely complements the rich, resonant sonorities of the music. Also, The Tale of Tsar Saltan, suite. Maria Larionoff, violin; Gerard Schwarz, Seattle Symphony. Naxos 8.572693. Russian composer Nikolai Rimsky-Korsakov (1844-1908) wrote his symphonic suite Sheherazade in 1888, describing it as "a kaleidoscope of fairy-tale images and designs of oriental character." As such, it really isn't so much descriptive as it is evocative, with only the narrator, the beautiful slave girl characterized by the solo violin, being a specific representative element. The composer did give the four movements in the suite names, however, which he later withdrew. Nevertheless, they persist. "The Sea and Sinbad's Ship" (Prelude) sounds wonderfully smooth, flowing, light, and airy under the conductorship of Gerard Schwarz and his Seattle Symphony players. Schwarz emphasizes the lyrical qualities as well as anybody, nicely catching the beauty and rhythms of the piece. "The Kalender Prince" (Ballade) displays a pleasingly glamorous touch, the exotic Middle-Eastern motif exploited to the fullest. Moreover, concertmaster Maria Larionoff's violin solos (she plays on a 1775 Guadagnini) as the young narrator are sweet and delightful. Under Maestro Schwarz, "The Young Prince and Princess" (Adagio) is appropriately romantic and engaging, taking us to "The Festival at Baghdad--The Sea" (Finale), which Schwarz ensures is as thrilling as it is dashing. The program concludes with an orchestral suite from Rimsky-Korsakov's opera The Tale of Tsar Saltan. It is brief, four movements of two-to-seven minutes each, but it carries with it the same kind of fairy-tale qualities we find in Sheherazade, if not quite so entrancing. Although Schwarz produces a commendable Sheherazade in almost every way, there is formidable competition available, much of it at the mid-price point, and unless one has to have the music in the very latest digital sound, there are other recordings to consider. For example, Fritz Reiner (RCA or JVC) is more exciting; Bernard Haitink (Philips) is more poetic; Kirill Kondrashin (Philips) is more dramatic; Sir Charles Mackerras (Telarc, also digital) is more expressive; and Sir Thomas Beecham (EMI) is more magical. What's more, all of these older recordings sound equally good as or better than the Schwarz Naxos disc. 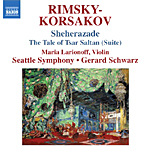 Recorded at Benaroya Hall, Seattle, Washington, in 2010, the audio is among Naxos's better efforts. It is full and wide ranging, with decent impact, a broad dynamic spread, and sparkling highs. Midrange transparency comes through nicely, and stage depth, while modest, is realistic. Although the deepest bass is somewhat light in Sheherazade, the mid-bass more than makes up for it. Besides, the deep bass comes through much better in The Tale of Tsar Saltan, which Naxos recorded a month or so later with what seems like different miking. Perhaps not in the absolute top tier of audiophile recordings, the sound, nonetheless, should disappoint no one. Also, Cello Sonata. 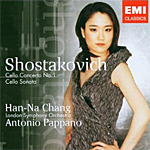 Han-Na Chang, cello; Antonio Pappano, London Symphony Orchestra. EMI 0946 3 32422 2. After listening mainly to the symphonies for so long, it's hard for me to remember that Russian composer Dimitri Shostakovich (1906-1975) could have his lighter moments as well. 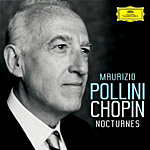 Not that his Cello Concerto of 1959 or his Cello Sonata of 1934 are lightweight by any means, but by comparison to his really heavy and often sardonic symphonies, they can seem positively blithe. The Cello Concerto No. 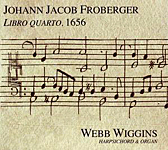 1 begins robustly, moves into a relatively pensive Moderato, followed by an unaccompanied Cadenza, and concludes as it began with a vigorous Allegro. Some observers have found a trace of the composer's condemnation for Soviet anti-Semitism in the music, but it works best as a straightforward, assessable, and highly enjoyable piece of non-biased music. Probably the most famous recording of the work is Rostropovich's on Sony, recorded just after the composer premiered the work in 1959. But on the present recording Ms. Chang acquits herself quite well, and I can't imagine anyone complaining about her lack of spirit or sensitivity or conductor Antonio Pappano and the London Symphony not lending her the utmost support. The Cello Sonata is perhaps a touch more bizarre than the Concerto because Shostakovich wrote it in response to Stalin's dictate for "Socialist Realism," whatever that meant. Well, it appears to have meant whatever music or literature that Stalin happened to like, meaning ultraconservative. So Shostakovich gave his Soviet master what he wanted, to a point, with what appear to be fairly sedate opening movements, followed up by a finale that turns into an old-time Keystone Kops silent comedy. It's pretty amusing, actually. This time Antonio Pappano accompanies Ms. Chang on piano, both of them poised and primed for action. EMI made the recording in their celebrated Abbey Road Studio One, where the London Symphony sounds well balanced and well focused, if a touch forward for my taste. In the Concerto, the engineers spread the orchestra well out across the sound stage, and in the Sonata they offset the two players realistically.